The wealth of Mesopotamian civilization was irresistible to non-sedentary peoples living in the hills and deserts. By about 2300 b.c., many of these peoples had begun to attack civilizations in order to gain the benefits of civilization for themselves. A pattern soon emerged in which “barbarian” invaders seized control of a civilization, built an empire, and eventually became a civilized people—only to fall to new invaders in their turn. Between the 4th and 3rd millennia B.C., a great many peoples began to move around in western Asia in larger numbers than ever before. They came from two major linguistic groups and two different areas: peoples speaking related Indo-European languages from north of the Black Sea; and peoples speaking related Semitic languages from the Arabian and Syrian deserts. Semitic migrations. The first to move into the region of Mesopotamia were various groups of Semitic-speaking peoples from the desert grasslands of Arabia and Syria. Although probably not members of a single ethnic group, the Semitic-speaking peoples shared a common culture. That culture was reflected in the similar structure, vocabulary, and ideas that were common to their related languages. Even now, Semitic languages like Arabic and Hebrew are closely related linguistically, although those who speak them maintain separate ethnic identities. The Semitic-speaking peoples were originally nomadic or semi-nomadic pastoralists who survived by herding their flocks of sheep and goats. For centuries, pastoral nomads had interacted with the cities of Mesopotamia, gradually becoming partially urbanized. During the winter months, they took their flocks and herds out into the steppelands between desert and river valleys to graze. In the summer, as the steppelands became hotter and drier and pasturage disappeared, they returned to settle near the cities and their water sources. As early as the 3000s, some Semitic-speaking pastoralists began to filter from the Syrian deserts into the northern cities of Sumer. Although most maintained their seasonal migration patterns, others gradually settled down and began to adapt themselves to the Sumerian style of civilization. Some lived among the Sumerians and served Sumerian kings. 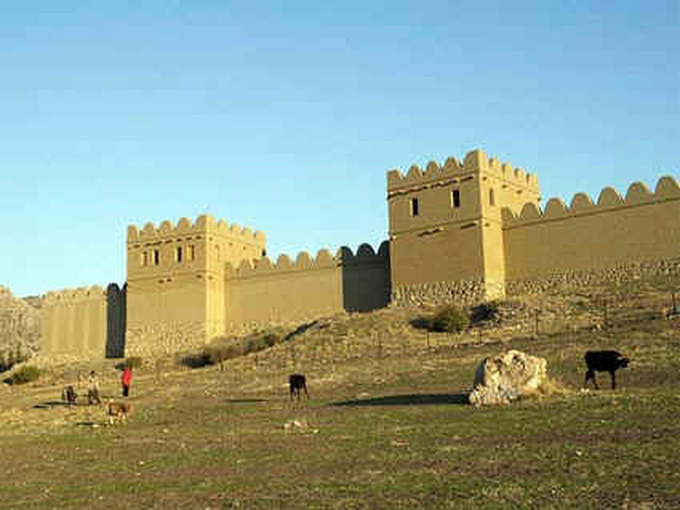 Others established towns and cities of their own along the middle and upper reaches of the Euphrates and Tigris Rivers. They brought with them from the harsh desert environment their own drive for survival and their skill in war. The Akkadians. 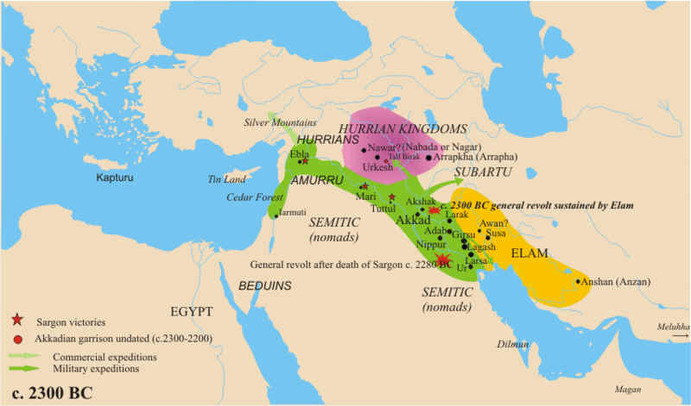 About 2331, one of these Semitic-speakers emerged in northern Sumeria to establish his own city and to lead his people in conquering all the surrounding cities. 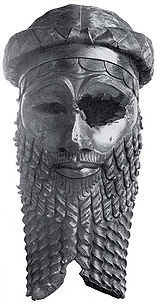 We do not know his name, but he is known to history by the title he assumed—Sargon I of Akkad. Sargon was the first real empire-builder that we know of. From Akkad he moved south and conquered all of Sumer. He also conquered territories to the north and west to gain control over cedar forests and silver mines. In this process, he united the irrigation agricultural regions of the south with the rain-fed agricultural regions of the north, in what is now northern Iraq, Syria and southern Turkey. Eventually, he ruled a state that stretched from the Mediterranean to the Persian Gulf. Sargon's impact on subsequent generations in Mesopotamia was enormous. Later generations referred to him as “Sargon the Great.” His example became the role model for all empire builders. Later empire-builders who tried to establish their own power usually added the title "king of Akkad" to their own titles to legitimize themselves as the true heirs of Sargon's authority. An Akkadian legend about him was still being read a thousand years after his death, and 700 years after that his exploits still showed up on a Babylonian world map - indeed, we are still writing about him over four thousand years after his death. Like earlier kings, Sargon and his successors justified their right to rule by claiming that they had the gods’ approval and that they acted as their representatives on earth. Although Akkadian became the language of administration throughout Sargon’s empire, Sumerian continued to be the primary religious and literary language. He and his successors also left the powerful Sumerian priesthoods intact—their continuing influence in Akkadian society insured the continuity of Sumerian culture. Sargon’s empire only lasted about a century. Sometime around 2170 B.C., it suddenly collapsed. Some paleoclimatologists, scientists who study ancient climate conditions, have suggested that a major climate shift was partially to blame. Around 2200 B.C., a general cooling of the North Atlantic Ocean caused an abrupt reduction in the amount of rain that fell in the highlands of Anatolia and northern Mesopotamia. The result was a massive drought that lasted about three hundred years. For the rain-fed agricultural lands of the north the onset of this period of drought was totally devastating. The archaeological record shows a general abandonment of the cities dependent on rain-fed agriculture in the plains of northern Mesopotamia as people fled south to the comparative safety of irrigation agriculture. The reduced rainfall, however, had also cut the amount of water that normally flowed down the Tigris and Euphrates, perhaps as much as 50%. With half as much water to depend on, and an influx of refugees from the north that nearly doubled the populations of some southern cities, it was not long before some cities rose in rebellion against their Akkadian overlords. At the same time, probably driven by the same drought conditions, nomadic peoples also began to move towards the remaining water sources. As Akkadian power declined, for example, new Semitic-speaking groups from the north and west like the Amorites began to raid into Mesopotamia. The final blow, however, came from another migratory people, the Gutians, who originated in the Zagros mountains. it was overthrown by revolt from within and yet another invasion by raiders from the Zagros Mountains. Meanwhile, however, the Akkadians had adopted and spread the cultural heritage of the Sumerians far beyond the original river valleys. They had also established the precedent and basic pattern for future empires in the Fertile Crescent. The rulers of Ur gradually created a centralized government and economy. Economic records from the period show a wide variety of occupations for the people of the empire. Men dug canals, harvested crops, and towed canal boats, while women wove fabrics, drained fields, and harvested crops. Workers were paid with bread, oil, and beer. Many traders worked for the kings, importing wood, herbs, and especially metal ores, which they paid for with wool, barley, or uncoined silver. They also established a unified code of laws, the Code of Ur-Nammu, the earliest law code so far discovered, though there are references to even earlier law codes from the city of Lagash about 200 years earlier. Despite their efforts, however, the kings of Ur were not strong enough to keep the empire unified. As the great drought continued, they too had to deal with water shortages and raids from unruly nomads and other marauders. Cities gradually became isolated from each other as people abandoned their outlying farms to seek protection within city walls. They gave instructions that my city should be utterly destroyed. They gave instructions that Urim should be utterly destroyed. They decreed its destiny that its people should be killed. In return for the speech which I had given them, they both bound me together with my city and also bound my Urim together with me. Anis not one to change his command, and Enlil does not alter what he has uttered. 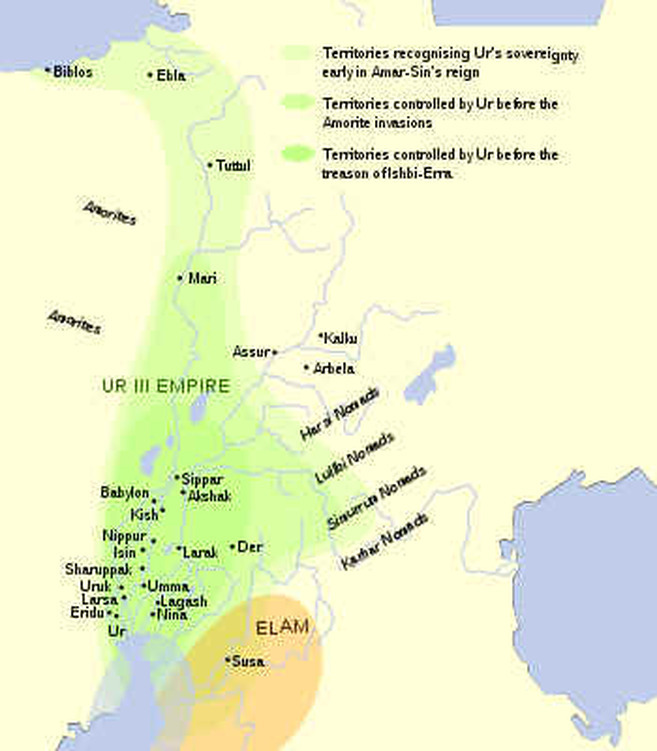 Although the Elamites were soon thrown back from Sumerian territory by the king of Ur's governor in the city of Isin, the dynasty in Ur never recovered the kingship. For a time, various cities in the south fought for power, but over the next 250 years the real balance of power shifted from Sumer to cities further north, where Semitic-speaking peoples like the Amorites had begun to settle. In the meantime, kingship retreated to the local level as the city-states became effectively independent once again. Despite the collapse of any sort of central power uniting the city-states, the idea of empire never disappeared after the fall of Ur. Akkad and Ur between them had established unified imperial rule as the ideal in Mesopotamian political life. It was not until 1792 B.C., however, that an Amorite king named Hammurabi assumed the throne in the city of Babylon, on the middle reaches of the Euphrates, and began a successful process of reunification. Hammurabi reunited Mesopotamia in what scholars call the Old Babylonian Empire. The Amorites had settled Babylon sometime before 1800. Like the Akkadians before them, the once nomadic Amorites soon adopted the most important features of the culture and civilization established by the Sumerians. Yet also like the Akkadians, the Amorites incorporated some of their own traditions and ideas to create not a mimicry of Sumer but an extension and expansion of the Sumerian model. The difference between the two was perhaps most clearly demonstrated by their legal systems. Hammurabi is perhaps best known for his collection of legal rulings, known today as the Code of Hammurabi. The Sumerians had also kept such codes, which almost certainly provided a basis for that of Hammurabi. Hammurabi’s code in turn became the basis for later Mesopotamians as well as a model of literary style. It included regulations covering divorce, contracts, and physicians’ fees. Extensive regulations also dealt with agriculture and commerce. At the same time, Hammurabi's Code provides considerable insight into the hierarchical nature of Mesopotamian life, and the differences between the earlier Sumerian approach to law and that of the Semitic-speaking Amorites. In general, for example, unlike the earlier Sumerian law code of Ur-Nammu, it embodied the principle of 'an eye for an eye and a tooth for a tooth.' "If a builder constructed a house for a seignior, but ...the house which he built collapsed and so has caused the death of the owner of the house, that builder shall be put to death." On the other hand, equal treatment did not prevail between members of different social classes. For example, if one gentleman struck another, he was fined a small amount of silver. If a slave struck a gentleman, he had his ear cut off. Like Sargon before him, Hammurabi absorbed and built upon the civilization that had begun in Sumer. To justify his rise to power, for example, he claimed that the Sumerian gods and goddesses had elected Babylon’s god Marduk to be their king. At the same time, he honored the old Sumerian gods and allowed the Sumerian priesthoods to retain their power and influence in society. Although Akkadian became the common language of the empire, Sumerian continued to be studied in Babylonian schools—much as Latin is in Western European countries today. The Babylonians thus maintained relative peace in Mesopotamia for about 400 years. They too, however, eventually fell to raiders from the north. These new invaders were not Semitic-speaking peoples, however, but peoples speaking a group of related languages that scholars call Indo-European. Although scholars still debate their origins, most believe that the Indo-European speaking peoples probably originated in the Pontic-Caspian Steppe, the great sweep of grasslands that stretched roughly from the Carpathian to the Ural Mountains north of the Black Sea and the Caspian Sea, in what is now Ukraine and southern Russia. Like Semitic-speaking peoples, Indo-Europeans probably did not represent a single ethnic group, but rather many groups who shared common cultural traits. Perhaps the most important distinguishing feature of the Indo-European speaking peoples was their association with horses, which they were the first to domesticate by about 4000 B.C. The horse made them extremely mobile and also gave them an advantage in raiding. Cattle were also extremely important among many Indo-European peoples. Horses, cattle, and the concept of ritual sacrifice to the gods, who embodied the forces of Nature, were important elements in Indo-European religion. As might be expected, the social customs of the Indo-Europeans seem to reflect a pastoral, nomadic background. Like other pastoral nomads, Indo-European peoples were patriarchal, with fathers exercising strong control over their families, and patrilineal, tracing descent in the male line. On the basis of these paternal kinship ties, they organized themselves into clans and tribes. They also had a strong warrior tradition—apparently an outgrowth of raiding one another for cattle, horses, and women. Also like many other nomadic peoples that had learned to survive in harsh environments, Indo-Europeans valued hospitality - indeed, it was a sacred matter, with both hosts and guests mutually obligated to one another, as represented by the giving and receiving of gifts. 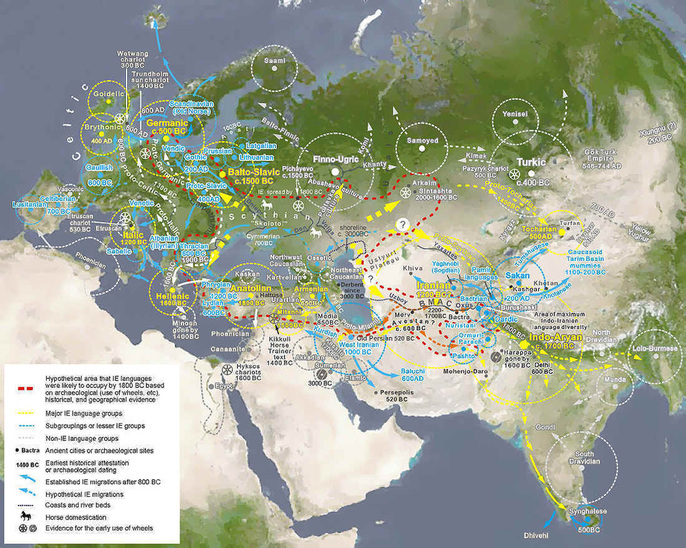 According to the most popular theory prevailing among scholars, the Indo-Europeans began to spread in all directions from their original steppe lands sometime during the 4th millennium B.C. Many small groups gradually migrated south into Asia Minor (present day Turkey) and into the mountains north and east of Mesopotamia. The earliest spread was probably due to a combination of factors - particularly the natural process of population growth, and the consequences of domesticating the horse, as well as other animals like cows and sheep. For on thing, using horses for transportation made them extremely mobile. At the same time, more people meant the need for more pasturage for the animals on which they depended, and so the original Indo-European speakers gradually extended their culture and methods of environmental adaptation over more and more territory. As part of this process, they probably incorporated older, non-pastoralist populations of hunters and gatherers either through intermarriage and cultural absorption (as the pastoral lifestyle proved to be a more efficient means of survival) or, if necessary, outright conquest. About 2000 B.C. and 1200 B.C., however, perhaps driven by sudden changes in climate, the movement of Indo-European speakers increased into what seem to have been two large-scale waves of migration. Eventually, these movements spread Indo-European languages from Ireland in the west to India in the east. After about 2000 B.C., the Indo-Europeans became all but irresistible in battle by combining their skill with horses with the Sumerian invention of the four-wheeled cart. Adapting the cart for battle, they developed a light two-wheeled war chariot. New harnessing gear allowed the horses to pull the chariots more effectively and more rapidly—a tremendous advantage on an open battlefield. The warriors from the steppes also armed themselves with short compound bows—wooden bows reinforced with pieces of bone for added power—which they could use over the shoulders of the chariot-drivers. Thus they could circle an army of foot soldiers and wreak havoc. One of the most successful groups of the Indo-Europeans in southwest Asia was the Hittites. The Hittites had originally filtered into Asia Minor (present-day Turkey) sometime before 2000 B.C. There they settled down and assimilated into the local population, sometimes even adopting local gods. As the migration of more Indo-Europeans from the north led to instability and increasing warfare in the region, however, sometime in the 1800s the Hittites came together under a powerful king named Hattusilis I. Hattusilis built a strong hilltop fortress for protection at Hattusa in central Asia Minor. From there, he began to conquer the surrounding region. Eventually, the Hittites built a strong kingdom in Asia Minor and expanded into Mesopotamia and northern Syria. Hittite technology. In addition to mastering the art of chariot warfare, the Hittites were also apparently the first to mine iron on a large scale. For many years, scholars believed that the Hittites were the first to discover the secret of iron-working and that it was their jealously-guarded monopoly on iron weapons and tools that contributed to the success of their empire. More recent scholarship, however, has challenged this view. On the basis of new archaeological and historical research, it seems clear that iron was a highly valued product throughout the region from the Iranian Plateau to the Mediterranean and from the Black Sea to Egypt as early as 2000 B.C. The earliest iron objects we have found so far suggest that they were made of iron from meteorites, which is more easily worked than raw iron taken from the ground. Iron has to be smelted, or melted, at much higher temperatures than copper or tin, to separate it from the ore in which it is found. Unless it is purified in this way, simple iron is not as strong nor as easily sharpened as bronze. On the other hand, once the iron has been separated from the ore, it can be made into a much more durable metal. When combined with a small amount of carbon during the smelting process, iron becomes even stronger as a crude form of steel. Most important of all, however, is the fact that iron ore is generally more plentiful in the world, and does not need to be mixed with any other mineral in order to be worked into effective tools and weapons. In effect, iron was simply cheaper to produce on a large scale than bronze. Although we do not know whether the Hittites were the first to learn the techniques for making iron, they did control rich iron-ore deposits in their territory. Iron itself had been known in the regions around Mesopotamia and Anatolia since about 2000 B.C. Probably because it was more difficult to work than copper and bronze, at first iron was used as an item of prestige and wealth. By about 1100 B.C., however, it was being used to make tools and weapons. The plentiful supply of iron ore, and especially the fact that it did not need to be mixed with other minerals like zinc or tin, meant that more iron weapons and tools were available and were thus less expensive than tools made of copper or bronze. No longer would metal tools be available only to a wealthy elite. First among the Hittites, and then among other peoples who learned the use of iron, more and more ordinary people were able to afford the new weapons and tools. Hittite society. 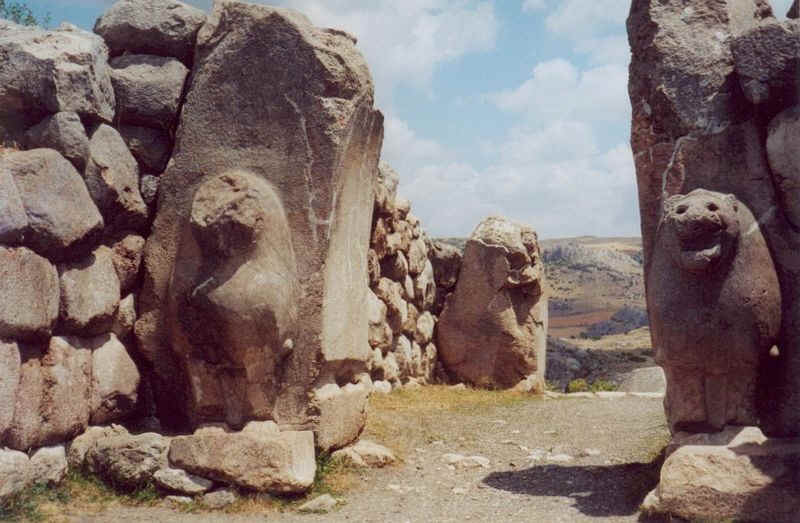 Hittite society reflected its Indo-European background. At the top the king functioned primarily as a war chief. He was the supreme commander, and he generally took part in the battles himself. As the chief priest he also fulfilled an important religious role in preserving the correct relationship with the gods through the proper sacrificial rites. He was aided by his queen, who filled a much more important role than most queens had done in Mesopotamian society. The queen too was a religious figure and conducted special religious ceremonies. Beneath the monarchs were the Hittite nobles, including the rest of the royal family. The king gave his nobles land in exchange for a regular tribute in horses, as well as soldiers to serve in the army. The ordinary soldiers provided the base on which Hittite society rested. Expansion and decline. As the Hittites expanded, they soon came into conflict with other powers, notably an expanding Egyptian Empire. In 1274, at the battle of Kadesh in northern Syria, the armies of the two “superpowers” fought a great but indecisive battle. Shortly thereafter, they agreed on their boundaries and actually became allies. In the 1200s, however, both Egypt and the Hittite Empire fell victim to the second great wave of Semitic and Indo-European migrations. This time they were attacked by the so-called Sea-Peoples—raiders in the eastern Mediterranean. While Egypt survived the attacks, the Hittites were so weakened that they soon fell to yet more Indo-European invaders from the north. In their place smaller kingdoms eventually emerged to dominate Southwest Asia. Perhaps the most important beneficiaries of this second wave of invaders were the Assyrians of northern Mesopotamia. 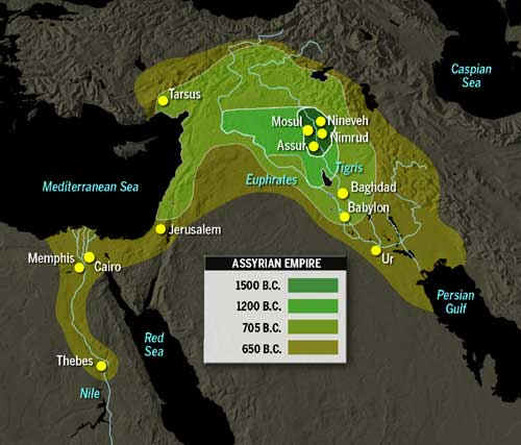 A Semitic-speaking people, the Assyrians had settled the city of Asshur on the upper Tigris as early as the 3000s. Their relatively open and accessible homeland made them an easy target for invaders, however, and for centuries others had dominated them. Shortly before the rise of the Hittites, the Assyrians had fallen prey to the Hurrians, a hill people who had been organized by migrant Indo-European groups and taught the new chariot warfare. The Hurrians had absorbed the remnant of the Babylonian Empire and established their own Mitanni Empire, which was eventually overthrown in turn by the Hittites. Even before Hittite intervention, however, in 1380 the Assyrians had begun their own 50-year struggle for independence from the Mitanni Empire. When the Hittites finally defeated Mitanni around 1330, the now warlike Assyrians were able to create their own empire in Mesopotamia. Continuing to gain in strength, the Assyrian Empire grew to become one of the three great powers of the region, rivaling the Hittites and the Egyptians. Assyria too suffered from the second wave of Indo-European migrations, and the empire broke apart about 1200 B.C. Unlike the Hittites, however, the Assyrians eventually recovered their strength and began to rebuild their empire. Determined that no one would ever dominate them again, they set out to become the foremost military power in southwest Asia. As they expanded into the territory once controlled by the Hittites, the Assyrians gained control of the rich iron mines of Anatolia. Soon they began to use iron for both tools and especially weapons. 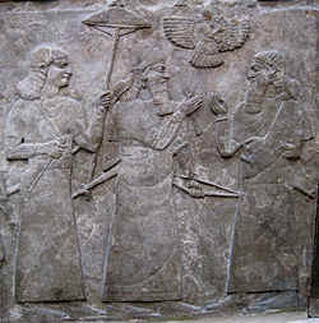 The Assyrian army was the first to use iron weapons on a large scale instead of bronze. The Assyrians were also the first to organize their army into regular units of a uniform size. All adult Assyrian men served in the army, which was commanded by officers who were promoted or demoted according to their ability in battle. Since they controlled iron mines in the mountains just north of them, they were able to arm their warriors with the latest military technology—iron weapons and iron battering rams on wheels, which could breach city walls. They also added cavalry to their heavy and light infantry and their chariots. The most important part of the army was probably the massed archers, who fought on foot and were protected by shield-bearers. With this formidable force, the Assyrians brought most of southwest Asia under their sway. At its height, the second Assyrian empire included all of Mesopotamia, Asia Minor, Syria, Palestine, and the Nile Valley of Egypt. The Assyrians not only established a standardized system of law and government throughout the empire, they also kept all the provinces in close communication through the use of a messenger system of relay horses. To facilitate these messengers and to make troop movements easier, they built a road network throughout their empire. The new roads also had the advantage of making trade easier. Soon merchants from all over the empire were bustling along the new imperial highways. The imperial language, Aramaean, became almost universally used throughout the region. I caused great slaughter. I destroyed, I demolished, I burned. I took their warriors prisoner and impaled them on stakes before their cities. . . . I flayed the nobles, as many as had rebelled, and spread their skins out on the piles [of dead bodies]. . . . Many of the captives I burned in a fire. Many I took alive; from some I cut off their hands to the wrist, from others I cut off their noses, ears and fingers; I put out the eyes of many soldiers. I burnt their young men and women to death. To counter opposition, the Assyrians settled large groups of soldiers as colonists in areas of potential revolt. They also resorted to mass deportation of peoples from their homelands, resettling them in other parts of the empire. Such techniques of control worked for a time, but they bred such hatred among the conquered peoples that they probably fuelled more rebellions than they prevented. Soon the empire was also plagued by assaults from beyond its borders. In 612, an Indo-European speaking group from northeastern Iran, the Medes, joined the Babylonians (or Chaldeans as they were now known) to destroy the Assyrian capital of Nineveh. The Assyrian empire crumbled. Its remains were picked over by the Chaldeans, who established a second or neo-Babylonian Empire, the Medes, and the Egyptians. In 550 B.C., however, yet another group of Indo-European speaking invaders, related to the Medes, emerged from southwestern Iran to overwhelm them all—the Persians.